Use the BlackBerry Application Loader (in the Desktop Manager) on your PC to load the application onto your BlackBerry download the latest version to your PC (located in the zip archive). On the PC, select the BlackBerry Transfer tab and click Put File. Tip: You may wish to use the ShowMate Practice presentation that is included on the ShowMate CD-ROM to practice converting and loading. If you have misplaced your ShowMate CD-ROM, download the ShowMate Practice Presentation now. Insert the Bluetooth® USB adapter into the BlackBerry input port on the ShowMate. 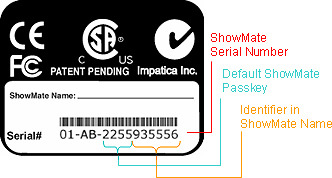 Note: If the serial number of your ShowMate starts with "03", there is no Bluetooth adapter; it is built into the ShowMate itself.